Snow: Don’t’ get me wrong, I mean it’s a dream vacation. I go inside the maximum security nuthouse, get past all the psychos, save the President’s daughter, if she’s not dead already…I’m thrilled you would think of me. So I have wrongly been associating this movie with John Carpenter and Kurt Russell. There is a certain attitude and story structure that definitely evokes this classic 80s sci-fi/action combo, but really, Lockout (or Space Jail, as I’ve been calling it) is much more in line with 90s Bruce Willis action movies. It has such a care free, “screw it” sort of attitude that making fun of the movie will get you nowhere, because it is very much in on the joke already. 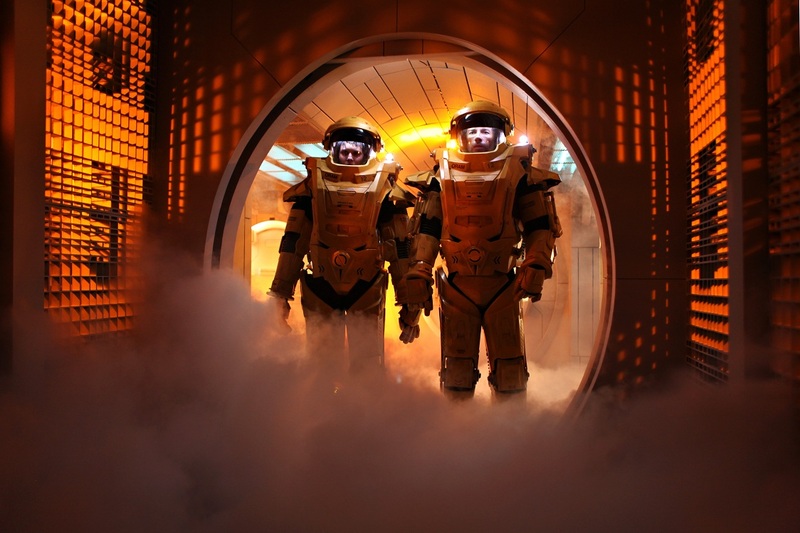 Space Jail cares very little about establishing realistic logic and is more concerned with having plenty of fun, as Guy Pearce spits out one-liners, while aboard a prison that is located in space. It is a simple gimmick, hovering over a familiar action flick plot, but the energy in its delivery kept a smile on my face. Set in 2079, the film begins with Guy Pearce as ex-CIA Agent Snow, recounting to the secret service why it is that he is now in their custody. We see a flashback that quickly establishes the tone of the film – an over-the-top exercise in action shootouts and chases. We see Snow on the run, after fending off some assailants; fall from the top of a building, before continuing to run away, only to find himself in a hectic motorcycle chase, before managing to ditch the precious briefcase in his possession, right before he is arrested. We now know Snow can handle himself in all sorts of situations. That is a good thing too, because Snow now has two options. He can either waste away in prison, for crimes he has been wrongly convicted of, or go on a suicide mission to rescue the president’s daughter. How did this suicide mission become an option? The president’s daughter, Emilie (Maggie Grace) was on a humanitarian mission to research the conditions of an outer space prison, only to have the prison become taken over by the violent inmates. The prisoners now have Emilie and several others as their hostages, with the leader, Alex (Vincent Regan), proving that he is ready to kill (his crazy subordinate, Hydell (Joseph Gilgun), is way past this point already, as well). Snow, of course, chooses to lend a hand in this situation, learning that he has something else to gain by stepping aboard a space prison filled with plenty of violent, degenerate scum. So now, it is going to take plenty of Snow’s abilities (which also includes heavy sarcasm, smoking, and a way with explosives) to properly rescue the President’s daughter and hopefully escape space jail for good. It truly is the energy that made me enjoy this film. 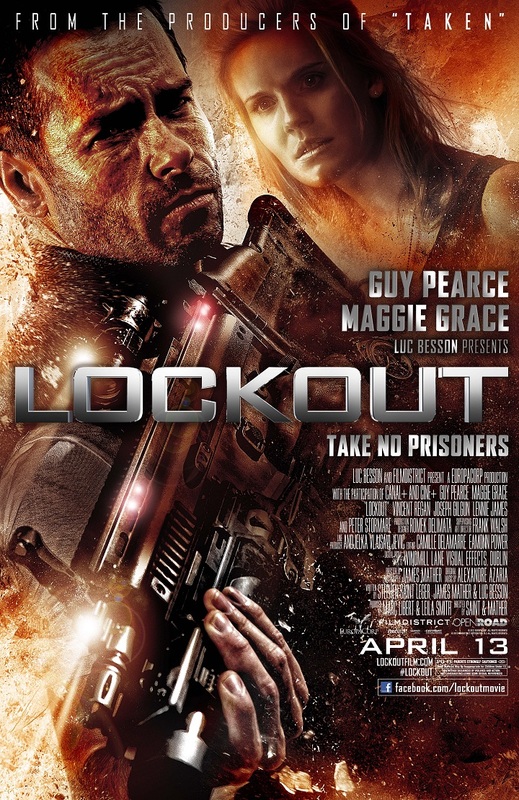 Even with a film like The Raid: Redemption simply existing to show that other action movies are going to have to step up their game, I still had a lot of fun watching Lockout, simply because the film did not let up in its pacing. There is very little downtime in this movie, as there is always something happening in the way of action, minor suspense, or Guy Pearce digging well into his role as a jerkishly lovable badass. Often times, movies of this nature fall apart mainly because once the premise has been established, the filmmakers seem to forget about having more fun with it and just have everything play out with perfunctory effort shown. I am not saying that Lockout really delves deep into its premise or defies the ways of less entertaining action films, but I am saying that the film is consistently entertaining because it makes good enough use of its resources. Snow: Here’s an apple and a gun. Don’t talk to bad guys, shoot them. The film comes from the mind of Luc Besson, who has delved into the world of sci-fi before with The Fifth Element, but now mainly serves as a producer who develops stories for action flicks and passes them off to his various director protégés (Taken, The Transporter series, District B13, Unleashed). 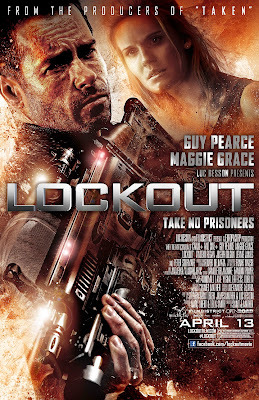 This time, writers/directors James Mather and Stephen St. Leger have stepped up to produce Lockout as their directorial debut and I will be curious to see where they go from here. The film has all the plotting it needs, without fleshing out what really doesn’t need added coloring and keeps everything pretty focused in one direction. At the same time, the direction is not super flashy, but felt confident enough (despite some editing comments, which I will address). 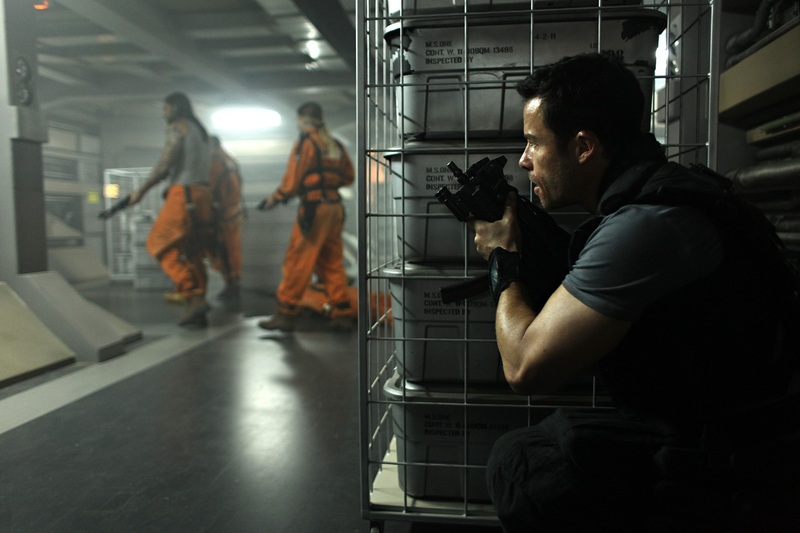 Lockout is certainly as much an action film as it is a sci-fi flick, so seeing the ways these characters get to fight, chase, and shoot at each other, while aboard a space jail was entertaining enough. The biggest concern I had was with how clear it seemed that Lockout had to have been a much more R-rated film, before being cut down to a cleaner PG-13. As a result, it is very noticeable that various edits have been made to shy away from some of the more violent moments of the film, which is unfortunate, given that it makes it difficult to properly assess how good the direction really is, if a studio was largely responsible for making the film slightly less comprehensible than how it originally came out. Given that I was quite entertained, I can at least say that I am looking forward to the “Unrated Cut” of the film on Blu-ray. Early on I brought up John Carpenter. While the film’s plot does evoke that of his ‘Escape From…” films (it is in my title for the review, after all), I still believe the film is akin to a different time. Lockout is not so much like a Carpenter film due to the fact that the pacing is so much more hectic. Carpenter is more deliberate in his pacing (a lot of his more action-y flicks have a Western motif). This film does have the same kind of deliberate characterizations for the various individuals, but is also fitting of its status as a Besson-produced flick that seems to be coming from the excessively, yet stylish days of 90s action cinema (another reason why the R-rating is missed). Plenty of people are killed, with little time to reflect on it and the various characters involved have just enough swagger to keep you more interested in them, without adding on much shading to it. Casting was a big part of why I enjoyed the film, with the majority of fun mainly revolving around Guy Pearce. Having played more serious and tortured characters in the past (Memento, LA Confidential), seeing Pearce play a guy who doesn’t take any crap, mouths off to everyone, and knows how to handle himself in a fight is a lot of fun. The added bonus of this film being almost as a much a dark comedy, filled with one-liners from Pearce, is a great way to emphasize the fact that this is a movie about a freaking space jail. Then you have the presence of the rest of the cast, including Maggie Grace, who manages to have some solid chemistry with Pearce; Lenny James and Peter Stormare, proving to be character actors qualified in just the right ways to make the film work, and the capably intimidating Vincent Regan, stepping away from being too over-the-top as the lead inmate/hostage taker and showing that he will do what he has to. Really though, if you can’t get past the opening five minutes of this film, especially the motorcycle chase, which is almost completely CG and bordering on incomprehensible, this film may not be for you. I can say that I may have questioned this moment, but I was quickly back with it, once the real plot of putting these characters into space jail really took hold. I refrained from addressing the sci-fi-ness of this movie, because it is really beyond reasonable logic that space travel is so easily accomplished a mere 60 years from now. I also did not really address the generic aspects of the overall plotting. What matters is the attitude and energy of this film. It is not one that takes itself seriously, lasts just as long as it needs to, and has a lot of fun in finding ways to play around with its concept and give Guy Pearce witty things to say and do. 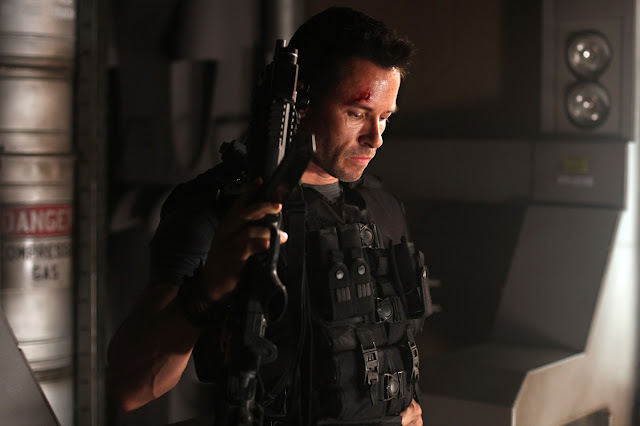 For silly, sci-fi action, Lockout is disposable but entertaining. Emilie: What if this doesn’t work? Snow: Well, then we’re probably gonna die.